Soups are a great way to eat less whilst still felling full, which is what the GI diet is all about. 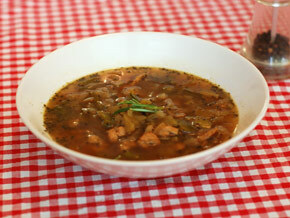 This soup presents a classic combination of pork and apple but in a soup form, producing a deliciously rewarding meal. Slice the onion first in one direction then the other to form small squares. Remove the core from the apple and again slice it into small squares. 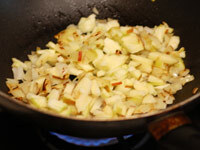 Fry the apple and onion in a small quantity of olive oil until the onion starts to brown slightly. Meanwhile chop the pork in to thin strips then into small pieces. Add the pork to the pan and fry for for 1 minute. Be careful not to over cook the pork or it will become too tough. 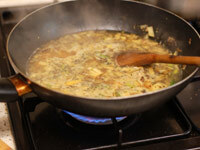 Add the bouillon, sage, sherry and 500ml of boiling water to the pan. Cover the pan and reduce the heat to low. Simmer for 30 minutes then serve.